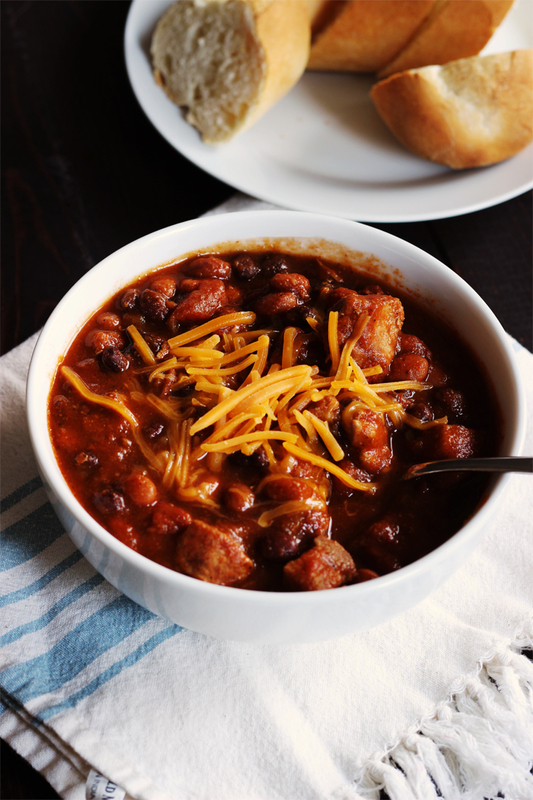 This Spicy Pork Chili with Pumpkin will wow everyone at your table. Tender chunks of pork simmer in a pumpkin-tomato sauce redolent with chile. Such a great way to warm up! This post is sponsored by the National Pork Board Porksgiving program in conjunction with One2One Network. I have received compensation for ingredients and time spent writing and recipe testing. All opinions are my own. To inspire people across the country to take the time to give and say thanks, the National Pork Board is celebrating “Porksgiving” – a time for giving back (with yummy pork dishes) to those who give. After all, there’s no better way to show someone how much you appreciate them than with a home-cooked meal! We’ve been cooking pork more often at our house this fall because 1. it’s so affordable and 2. I’m discovering new ways to make delicious dinners with pork! Like in this pulled pork, this pork tenderloin, or these pork medallions. While I can’t take it to her, I’m sending this virtual dinner to my cousin Laurie. Laurie and I spent lots of summers together as kids. For a variety of reasons, we fell out of touch over the last few years. I’m super thankful to have had the opportunity to reconnect this year. Laurie is a giver. She mothers her son, Mason, who was born with special needs, with a dedication that is nothing short of admirable. She works around the clock to care for his physical and emotional needs. Laurie reached out to me earlier this year when I was diagnosed with autoimmune thyroid disease, something that runs in our family. Despite how hard she works or how little she sleeps, Laurie has emailed me every week to see how I’m doing and to offer support. She has been a steadfast cheerleader. Laurie’s sent me links to studies and interesting medical findings so that we can learn together. She gives so much to me; I’m so thankful for the blessing she is in my life. 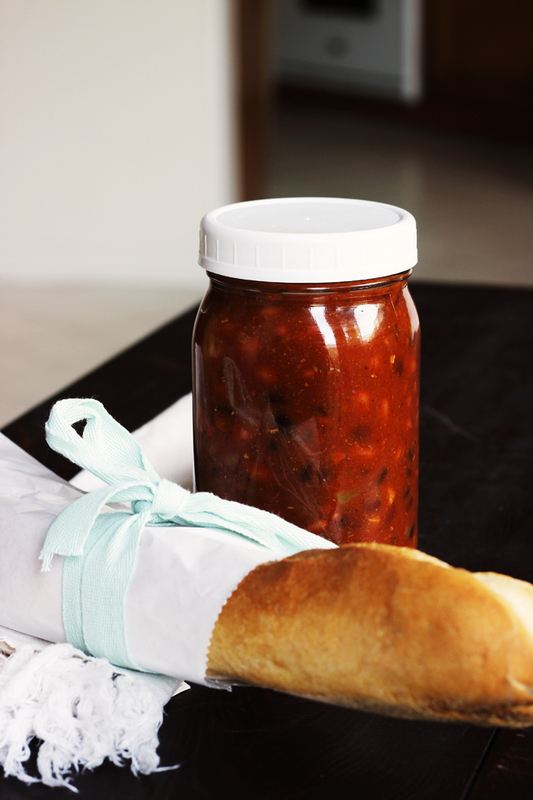 This Spicy Pork Chili is so yummy! I can’t send it to Wisconsin, but I’m sending it virtually to Laurie today. When will they invent taste-o-vision?! If you’ve got a friend in easy driving distance, then I highly recommend making up a pot of this to give as a gift. It’s so flavorful. My kids practically lick the bowls! This season, take the time to say thanks to someone who gives back – whether it’s loved ones who make time for their local community, a neighbor in the military, a co-worker who volunteers, or someone you know who gives a lot to their family and friends. Whoever it is, show them your appreciation this Porksgiving by serving up a new pork recipe. I recommend this one. Ahem. And you can get inspired to give back with juicy, tender pork all season by visiting www.PorkBeinspired.com/Porksgiving. There, the National Pork Board is sharing inspiration via stories featuring how Americans are giving back and saying thanks with the gift of pork. For more delicious pork-inspired recipes, be sure to follow the National Pork Board on Pinterest, Twitter, instagram, youtube, and Facebook. 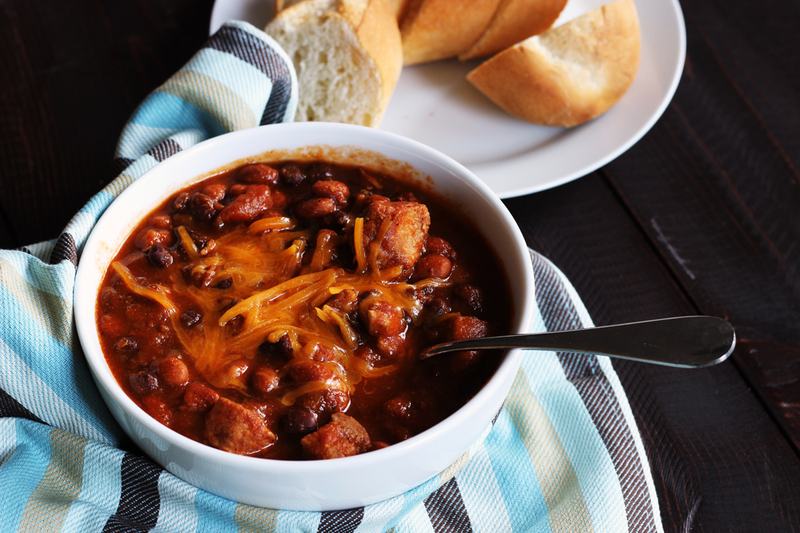 This Spicy Pork Chili with Pumpkin will wow everyone at your table. Tender chunks of pork simmer in a pumpkin-tomato sauce redolent with chile. Season the pork cubes with salt and pepper to taste. In a large nonstick skillet over medium heat, heat the oil until shimmering. Add the pork cubes and chopped onion and sauté. Cook until the pork is lightly browned and the onion is clear. In the crock of a 6-quart slow cooker, whisk together the pumpkin puree, tomato sauce, chili powder and garlic powder. Add the meat mixture, beans, tomatoes, and chiles to the pot. Stir well to combine. Cover with the slow cooker lid and cook for 4 hours on HIGH or 6 to 8 hours on LOW. I don’t think I have pinto beans, but I have black and kidney which should work just as well, and I have all these other ingredients as well. Thanks to Costco’s pork special on Black Friday ($10 off the vacuum pack loin) I have about 15 lb of pork in the freezer for which I paid about $8. That’s on top of the several pounds I already had in the freezer! I made pulled pork with the Costco rib rub seasoning (I’ve learned I’m not so keen on the pork ribs but love the seasoning on regular pork and it goes fabulously well with Asian salads), made some I diced and simply tossed with spices and pan cooked, and am going to make BBQ pork although I like that a lot better than the kid does. This sounds like an excellent way to continue using some of it up and not be repetitive. Thanks! Sounds like you scored. Great job mixing things up. I was getting the regular pork to make this when I found some kielbasa that had had the package torn so the meat was a bit dehydrated. I figured soaking it in something like this was a good way to not waste it, so I chopped it up and used it instead of the pork chops. I used fresh chopped garlic instead of powder, and had three different types of beans in it to use up some of what I had. I was surprised how dark the sauce turned but we enjoyed it and the non-spicy-loving kid ate two bowls, Thanks!